The names of the events are not always self-explantory, so would it be possible to receive some brief descriptions for all events? the events in the eventlog (e.g. "A_Incomplete"). Especially usefull to know if certain events trigger a particular customer activity (an update in a portal or email is send, etc.). In the both event logs, I found two attributes: Selected and Accepted. Would you please explain about these attributes. Thanks BPIC2017 for the clarification on this important topic. Can you clarify the meaning of Handle leads please? Difference between schedule and withdraw? If an application is submitted on the website, the first workitem that's created is 'handle leads'. Now the application is assessed for the first time (automatically). If the assessment is positive, a new workitem 'complete application' is created. If the assessment is negative, the application is 'declined'. If the assessment can't be completed because of technical problems, the workitem is still 'handle leads' and a new assessment can be done manually. Above you write that the workitem "handle leads" is an automatic first assessment of the application. However, in this other thread (http://www.win.tue.nl/promforum/discussion/comment/2045#Comment_2045) you wrote "Some of the statuses have a corresponding workitem for call agents to process". Both cannot be true. Are workitems manual steps or are some of them automated? If the latter is true, which workitems are automated? Does it maybe depend on their lifecycle transitions "start", "suspend", "schedule", etc.? In your above description of the Application-events you also suggested that between "A_Concept" and "A_Accepted" an employee calls the customer to complete the application. However, the event-log shows the workitem "W_Complete application" between "A_Concept" and "A_Accepted", which doesn't sound like a phone call. What's therefore the exact meaning of "W_Complete application"? Is this indeed a phone call by an employee? If yes, how is this call different from the workitem "W_Call after offers"? 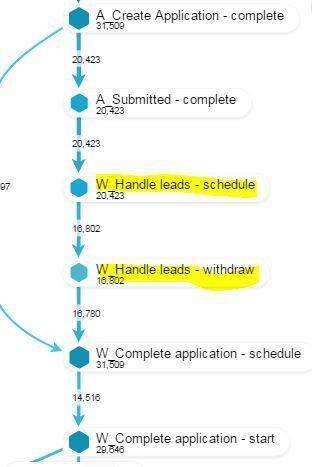 'Handle leads' is an automated first assessment of the application and automatically transfers to 'complete application' unless the first assessment cannot be finished automatically. In that case the 'handle leads' workitem is manually processed by an agent. After this first assessment, the customer is called to complete his application and make an offer. Is is the 'complete application' workitem and is indeed a phonecall. Call about offers is the workitem after the offer is sent where the customer (after a few days) is reminded about the offer. To ask if he received everything, still has any questions, is planning to accept the offer etc. I assume that each of the 8 different workitems is associated with some manual work. However, that probably depends on the specific lifecycle transition of that workitem. There are 7 different lifecycle transisitions of W_-activities (suspend, complete, start, resume, schedule, ate_abort, withdraw). Which of these involve some "real" manual work, and which ones are just system events with no subsequent manual activities? I could imagine that "suspend", "schedule", etc. fall into the category of pure system events, but I'm not sure. Can you give us a more comprehensive picture?